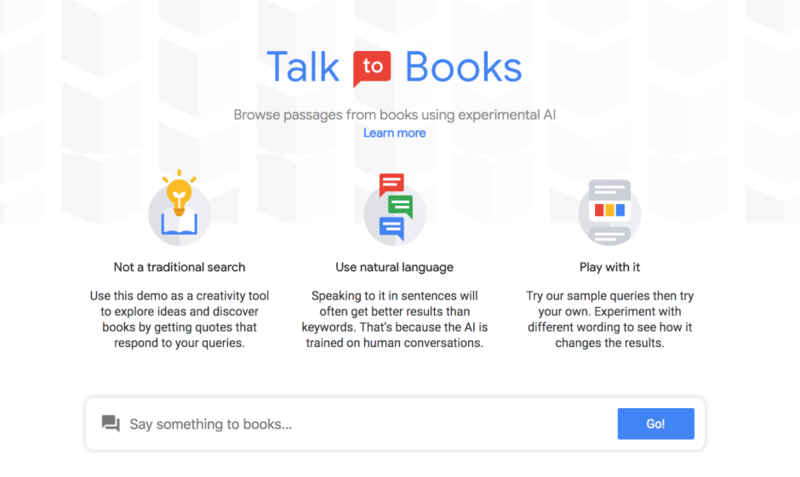 Google has created an AI that will scan sentences in books and create a list of likely responses. Imagine if you could gather thousands of writers in a circle to discuss one question. What would optimist Thomas L. Friedman say about intervening in Syria, for example? Would chaos theorist Santo Banerjee concur? Google's new tool, controlled by AI. Kurzweil noted that Talk to Books is not meant to replace keyword search. It uses “semantic search,” drawing on the ability of the tool’s AI to understand natural human language. Results range from goofy to profound, but semantic search’s goal is to call up a sentence that sounds like a plausible retort a person might say in a conversation. “Semantic search is based on searching meaning, rather than on keywords or phrases” elaborates Kurzweil on his blog. “Developed with machine learning, it uses ‘natural language understanding’ of words and phrases.” A director of engineering at Google, the 70-year-old transhumanism advocate leads a team studying how to train computers to read and respond like humans. Last year, his team introduced a time-saving utility for some of Google’s email products called “Smart Reply,” which parses an open email, and then spits out a handful of (theoretically relevant) pre-written responses for you to quickly select and send. Talk to Books is best deployed as a book-discovery or inspiration-gathering tool. It could conceivably be useful for brainstorming new angles on a topic or used as a quick way get quotes from books. “It’s good for exploring ideas, it’s fun just to play with it,” Kurzweil says.